WESTLAKE MARKET DISTRICT – NOW OPEN! Are you looking for information about our new Westlake Market District, which is replacing the existing Westlake Giant Eagle? Click for hiring details, including info on open positions, hiring events, recruiting center and more! At Market District, we celebrate a passion for amazing food and food expertise by combining the best of everyday grocery shopping with foods, ingredients and services rarely found in traditional supermarkets. In 13 locations in southwestern Pennsylvania, Ohio and Indiana, the Market District stores feature teams of chefs and other culinary professionals preparing fresh foods from scratch every day. All of our Team Members, Chefs and other culinary professionals are expertly trained to provide unsurpassed quality and service. And we love FOOD! Do you love, eat, cook, talk, dream and live food? Do you enjoy sharing your zest for food with others? Then Market District is your cup of tea! If you love food, are passionate about delivering unparalleled guest service and have an active interest in your community, consider joining our growing team. As a member of our Team, you’ll share your passion for food with guests and fellow Team Members, cultivating a dynamic foodie culture! We love Team Members who understand the difference between making a meal and making an adventure, so we take great care to match candidates with positions, setting you up for success the moment you walk through our doors. Market District is hiring experienced and entry-level Team Members for a cornucopia of full-time and part-time positions, ranging from Cheesemongers who are skilled in selecting the finest quality offerings in cheeses, butter and dairy, to expertly trained culinary chefs. Additional positions include bakers, caterers, and cashiers as well as Team Leaders and Team Members in deli, meat and seafood, produce, gourmet foods and guest service. Investing in our Team Members is our way of ensuring that you start off on a path towards a successful career with Market District. Start Your Foodie Career Today! For more information about Market District opportunities, click here to start your search and find a job near you! Come explore the Oooo in food. Watch our video to learn more about Market District. 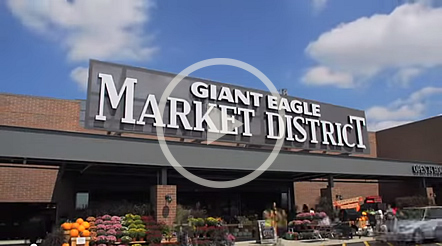 Welcome to the new Giant Eagle Market District at Grandview Yard. Its like Dinsey World for Food lovers! It’s truly an amazing to think that in 14 short years we’ve grown to nearly 50 supermarkets and GetGo convenience stores in the central Ohio area. I’m inspired by a store like this. I see food. I see the Team. I see the people. I see the design. It is something that is a completely evolved thought. Some times you get a really good thought ” Oh yeah let’s try to do it like that” and it comes out alright. This looks like everything has been conceived and considered and executed perfectly. This store truly takes it to a new level. We do this be offering the best in everything that we do. It’s the best in regional produce. It’s the best in local, national and international grocery items and an amazing restaurant, a truly amazing restaurant. And I have to say an unbelieveable bar. What really sets our stores apart though, is our Team Members. They are the ones who make the magic. They are the ones who work so hard to bring this store and this concept to life. You know this is going to be a great opportunity for us; not just now, but in the future. This is going to be developing and growing area, which is really exciting. There is a lot of fun stuff, customers are going to be excited. Restaurants booming over there. So we’rehaving a lot of fun. I’m really into your showcasing of local ingredientshere and I asked about that. It’s important to me that you carry local ingredients, not only prepared foods, but fresh produce and things when in season. This store is laid out really, really well. There’s such a variety of everything. More of an experience than just outright shopping. Just absolutely amazing. I live in the Bexley area and I will be driving here to do my shopping. A cut above the rest – I will say. A cut above the rest. Probably by far the best store I’ve been to. I declare this the finest store in Ohio. – DAVID, MARKET DISTRICT FRONT END SENIOR TEAM LEADER. PROUD TEAM MEMBER SINCE 2008.